dried rosemary - 1 tsp. Garlic Spice Rub (optional: blend salt/pepper/thyme/sage) - 1 tbsp. 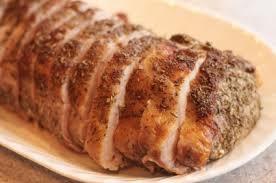 Marinate pork tenderloin in ¼ cup Apple Cider & Garlic Vinaigrette not less than 30 minutes. to brown well on all sides. Reduce heat to 325°F. Pour the ¼ cup apple juice into pan, add onion, celery and apple. Cover with foil. Roast until pork is done and very tender, basting occasionally, for about 1 hour. Remove from oven and allow to rest (covered) about 15 minutes. Pour 1 ½ cups apple cider into heavy bottomed saucepan. Add garlic cloves and bring to a boil. Reduce to medium and simmer until only ½ cup remains. Pour in the pan juices from the pork and return to a boil. Reduce until it becomes a sauce consistency of about ¾ cup volume. Strain and serve with pork. Best served with roasted harvest vegetables such as potatoes, carrots, parsnips, turnip, sweet potatoes and onions. "We test and taste every recipe we publish. The end result is often due to the collaborative efforts of talented cooks and chefs that we have adapted from; tweaking and tasting until it meets our garlicky criteria. Our recipes are developed with one goal in mind, to make cooking with Ontario garlic in your kitchen healthy, easy, delicious and fun. A healthy cook is a happy cook!" I have been growing and cooking with locally grown garlic for 20 years, and still, the diverse and profound affects of garlic in the kitchen are dizzying. The culinary spectrum when cooking with garlic can be a broad sweep or finely tuned detail. If you are cooking for wellness, food function, taste, entertaining or just as a culinary enthusiast garlic is certain to have a prominent role in your menu and in your life. A mixed background of free-lance writing, bookkeeping, interior design and passion for cooking are accredited with seasoning my entrepreneurial success as a food processor and garlic grower. Branding and navigating The Garlic Box's most valuable asset - garlic -Ontario grown garlic, has afforded me the opportunity to cook local and share. You'll find ongoing recipes, both fresh and value added all made with local garlic. Check us out regularly to see what is cooking in the kitchen. If you're cooking garlic, we'd enjoy sharing your recipes. Fortunately, I have children and grandchildren with refined palettes always eager to share in the joy and wellness passed around the kitchen table. James Beard said it right, "No good cook can cook without garlic."